List of more relevant works is found here. Maija Hynninen – composer and sound artist – is working in the areas of concert music, electronic instrument design and multidisciplinary performances. The essence of her music builds on the unique moments where the parameters of this world are slightly altered to allow a glimpse of another reality to be present. It can be a moment where the timbre of purely acoustical writing gives surprising results or when electronics project sounds into another domain, another space and reality. She entered the Sibelius Academy in 2003 (M.Mus. 2011) to study with Paavo Heininen while also working for a violin diploma at the Norwegian Academy of Music. The studies in electronics continued at IRCAM Cursus 2012–13. She is currently PhD Candidate at UC Berkeley, with Franck Bedrossian, Ken Ueno, Edmund Campion and Cindy Cox as her professors. She is also earning a PhD in electro-acoustic music in Sibelius Academy. She was amongst the finalists in Feeding Music composition competition organised by Divertimento Ensemble and EXPO Milan. Her music has been presented and commissioned by YLE (Finnish Broadcasting Company), Helsinki Chamber Choir, Avanti! Chamber Orchestra, the International Maj Lind piano competition, Camilla Hoitenga and Eija Kankaanranta among others. 2012–2013 IRCAM Cursus 1, practical training in computer music. Lessons in composition Mauro Lanza, lessons in electronics Éric Daubresse, Jean Lochard, Grégoire Lorieux, Mikhail Malt and Alexander Mihalic. 1998–2001 Helsinki University, musicology, studies. 1998–2000 Lahti Conservatory of Music, studies in violin playing and teaching. 2013 Saari residence supported by Kone Foundation 1.9.-30.10.2013 (full scholarship for two months artistic work at the Saari manor in Hietamäki near Turku, Finland). 2011 Acanthes course for young composers. Teachers: Unsuk Chin, Philippe Hurel and Oscar Strasnoy. Participated in chamber orchestra workshop and final concert with Orchestre National de Lorrain, cond. Jean Deroyer. 2008 Orkester Norden (Nordic youth orchestra), cond. Peter Szilvay composer masterclass in Kristiansand, Norway. Teachers: Rolf Wallin and Karin Rehnqvist. 2007–08 Avanti! Chamber Orchestra's XXII and XXIII Summer Sounds festival composition workshop: Sävellyspaja. Teachers: Magnus Lindberg, Jukka Tiensuu and Jouni Kaipainen, Porvoo, Finland. 2005–09 Time of Music festival composition courses. Teachers: Jonathan Harvey, Heinz Holliger, Jukka Tiensuu and Michael Finnissy. Grants for artistic work: Society of Finnish Composers Sibelius foundation, City of Vantaa, Finnish Cultural Foundation (6 and 12 month grants for artistic work), Arts Council of Finland (12 and 6 month grant for artistic work) Sibelius Academy, Luses, Lehtinen Foundation, Alfred Kordelin Foundation and Kone Foundation. Works commissioned by YLE (Finnish broadcasting company) and Viitasaari Time of Music -festival, Helsinki Chamber Choir, Avanti! Chamber Orchestra, the International Maj Lind piano competition, Earplay, and Camilla Hoitenga, commision grants from TEOSTO, Society of Finnish Composers Sibelius and Pegasos foundation, Arts Council Finland and YLE. [new work] for oboe and orchestra, Eeva-Kaisa Rönkä, oboe, Sinfonia Lahti, cond. Jaakko Kuusisto. [new work] for bass clarinet and flute, Earplay, San Francisco. June, Lightness of the Days, Camilla Hoitenga, bass flute, Eija Kankaanranta, kantele, Cologne. 21.2. Presenting works at CCRMA, Stanford University lecture series. 12.4. Freedom from Fear, Kyle Bruckmann, oboe, Maija Hynninen, electronics, CNMAT, Main Room, Berkeley. 8.5. Freedom from Fear, Kyle Bruckmann, oboe, Maija Hynninen, electronics and lights, Hertz Hall, Berkeley. 18. and 19.3. ...sicut aurora procedit, Mirka Malmi, vl, Ilona Jäntti, aerialist, Timo Kurkikangas, electronics, Oulu Music Festival, Finland. April, Birdie, animation film by Pirjetta Brander, Korundi, Rovaniemi. 4.5. Iced up, Soo Yeon Lyuh, haegeum, Maija Hynninen, haegeum, Center for New Music, San Francisco. 9.5. Earthship, Eco Ensemble, cond. David Milnes, Hertz Hall, Berkeley, US. 20.9. It is always today, Espais Oberts, Radio Catalunya. 22 and 23.9. 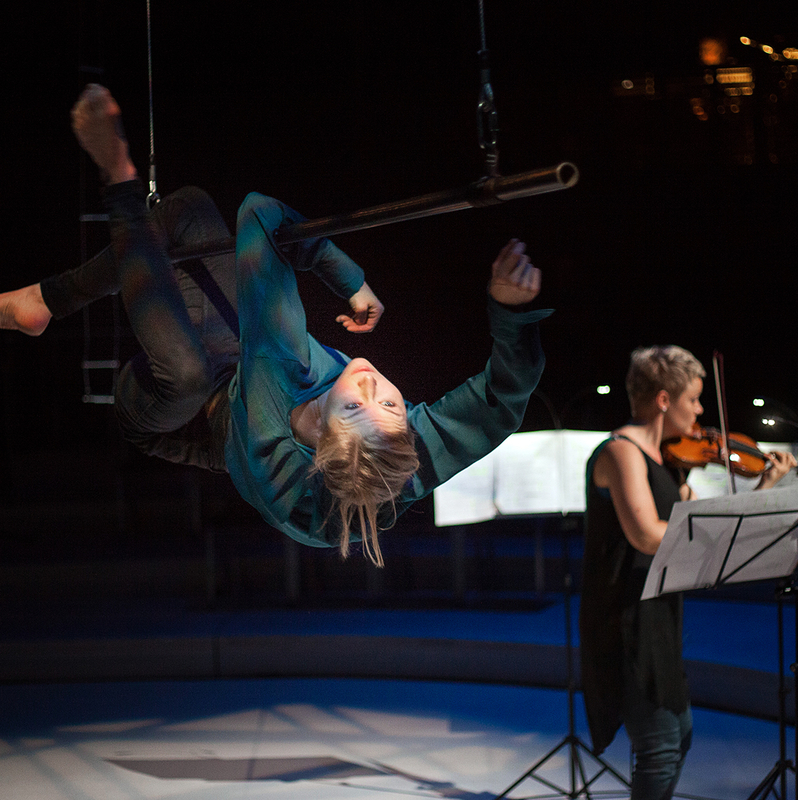 Earthship, Divertimento Ensemble, Maija Hynninen, electronics, EXPO 2015 Milano Italian Pavillion. The final round of composition competition Feeding Music. 13.9. and 23.11. ...sicut aurora procedit, Mirka Malmi, vl, Ilona Jäntti, aerialist, Maija Hynninen, electronics, Music Centre, Helsinki. 9.–13.4. Mental Balance Variants music for animation film in collaboration with visual artist Pirjetta Brander, Tampere Biennale -festival, Finland. 9.5.–1.6. Mental Balance Variants music for animation film, Tampere Biennale. 29.5.–1.6. Yo, genesis, music for dance production in collaboration with choreograph Julie Nathanielsz, Austin, Texas. 14.6.–31.8. Mental Balance Variants music for animation film, Serlachius Museums, Mänttä, Finland. 4.7. ...sicut aurora procedit, Mirka Malmi, violin, Sääksmäki soi! -festival. 17.9. Borrowed Tunes: 1. Dead Man Theme, Juho Laitinen, electric cello and electronics. Nordic Music Days, Oslo, Norway. 15.6. winnowing, Sonja Fräki, piano, Maija Hynninen, electronics, Kallio Kuninkala Festival, Järvenpää Hall, Finland. 27.8. Borrowed Tunes: 1. Dead Man Theme, Juho Laitinen, cello and electronics, Ostrava Days Festival 2013, Tsech Republic. 27.11. Borrowed Tunes: 1. Dead Man Theme, Juho Laitinen, cello and electronics, Finnland-Institut, Berlin. 18.12. New Holland, commissioned by The St Petersburg Pro Arte Foundation for culture and arts, eNsemble, cond. Fedor Lednev, The Hermitage Theatre, St. Petersburg, Russia. 11.5.09 Interpolations 2 Andrea Kiefer, accordion, James Andean electronics, Swedish radio P1 and P2. 7.9.16 Aina on tänään – It is always today, acousmatic piece. 28.8.13 Trois Mondes, Susanne Kujala, organ, Maija Hynninen and Veli Kujala, electronics. 12.4.12 winnowing, Emil Holmström, piano, Timo Kurkikangas, electronics. 6.12.11 Borrowed Tunes: 1. Dead Man Theme, Juho Laitinen, cello and live electronics. 23.10.11 winnowing, Jaana Kärkkäinen, piano, Maija Hynninen and Timo Kurkikangas, electronics. 19.7.11 winnowing, Jaana Kärkkäinen, piano, Maija Hynninen and Timo Kurkikangas, electronics. 7.9.10 Orlando fragments, Jutta Seppinen, mezzo soprano, defunensemble. 13.7.10 Orlando fragments, Jutta Seppinen, mezzo soprano, defunensemble. 20.2.09 Slutförvaringen–Kuinka puoliintuminen meitä liikuttaa, Helsinki Chamber Choir, cond. Nils Schweckendiek. autumn 2010 winnowing, Jaana Kärkkäinen, piano, Timo Kurkikangas, electronics, recording by the Finnish broadcasting company YLE. spring 2013	Trois Mondes, Susanne Kujala, organ, Maija Hynninen and Jukka Viiri, electronics, recording by the Finnish broadcasting company YLE. year 2013 Mental Balance Variants, The Polytech Choir, cond. Juha Kuivanen, recording to be released under a commercial label. spring 2014 Orlando fragments, Tuuli Lindeberg, sopraano, defunensemble, Maija Hynninen, electronics, recording by the Finnish broadcasting company YLE. bass cl, Tommi Hyytinen, hn, Miikka Saarinen, tp, Petteri Kippo, perc., Saara Olarte, harp, Mirka Malmi, vl, Carmen Moggach, vla, Juho Laitinen, vlc. Recorded and edited by Maija Hynninen, James Andean and Davis Ozolins at the studios of CMT at the Music Centre, Helsinki. 2007–	freelance music journalist and co-host of the programs ’The contemporary music classics’ and ‘The Finnish music of our time’ at Finnish broadcasting company, radio Yle 1. 2005–08 Sibelius Academy concert worker.